Coronal / Frontal / Lateral Bisects the body laterally from side to side, dividing it into front and back halves. Abduction and Adduction movements occur in this plane. Sagittal / Antero-posterior Bisects the body from front to back, dividing it into left and right halves. Flexion and Extension movements usually occur in this plane. Transverse / Horizontal Divides the body horizontally into Superior and Inferior halves. Rotational movements usually occur in this plane. The anatomical position is the point of reference for all movements. A sagittal plane, also known as the longitudinal plane, is perpendicular to the ground and divides the body into left and right. The midsagittal or median plane is in the midline i.e. it would pass through the midline structures (e.g. navel or spine), and all other sagittal planes (also referred to as parasagittal planes) are parallel to it. Median can also refer to the midsagittal plane of other structures, such as a digit. 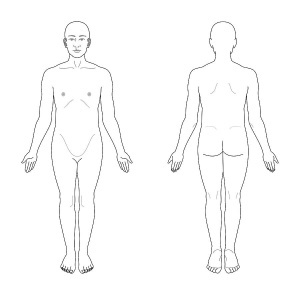 A coronal or frontal plane is perpendicular to the ground and divides the body into dorsal (posterior or back) and ventral (anterior or front) portions. A transverse plane, also known as an axial plane or cross-section, divides the body into cranial (head) and caudal (tail) portions. It is parallel to the ground, which (in humans) separates the superior from the inferior, or put another way, the head from the feet. 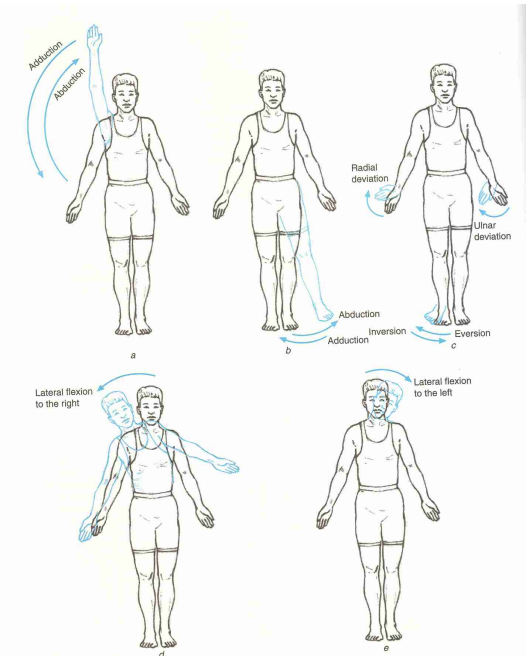 When describing anatomical motion, these planes describe the axis along which an action is performed. 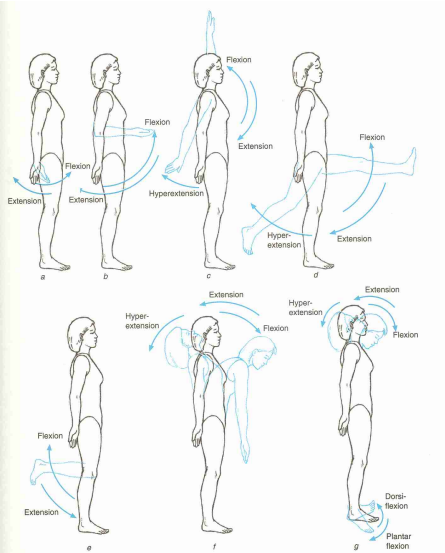 So by moving through the transverse plane, movement travels from head to toe. For example, if a person jumped directly up and then down, their body would be moving through the transverse plane in the coronal and sagittal planes. An axis is a straight line around which an object rotates. Movement at the joint take place in a plane about an axis. There are three axis of rotation. Sagital axis - passes horizontally from posterior to anterior and is formed by the intersection of the sagital and transverse planes. Frontal axis - passes horizontally from left to right and is formed by the intersection of the frontal and transverse planes. Vertical axis - passes vertically from inferior to superior and is formed by the intersection of the sagital and frontal planes. Extension occurs when the angle between two adjacent segments in the body increases as the ventral surfaces of the segments move away from each other and occurs in a sagittal plan about a frontal axis. An exception is extension of the thumb, which takes place in a frontal plane about a sagittal axis. 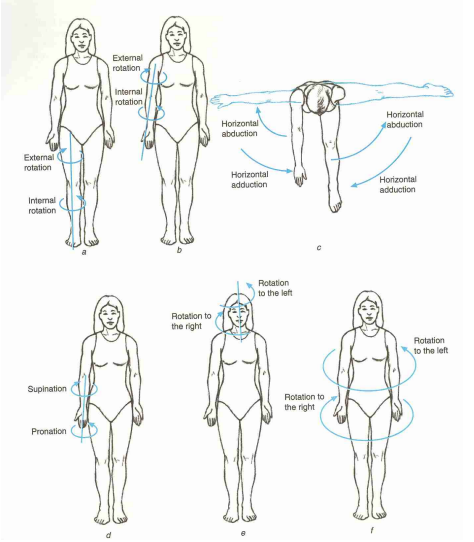 Flexion occurs when the angle between two adjacent segments in the body decreases as the ventral surfaces of the segments approximate each other and occurs in a sagittal plane about a frontal axis. An exception is flexion of the thumb, which takes place in a frontal plane about a sagittal axis. Rotation Rotation movements are in the transverse plane and include any twisting motion. Joints which permit rotation include the shoulder and hip. These are both ball and socket joints. We can also rotate our necks and backs due to a series of smaller joints, including the atlanto-axial joint which is a pivot joint in the neck between the first two vertebrae (C1 and C2). Rotation of the hip and shoulder can be broken down into internal or external rotation (also sometimes known as medial and lateral rotation respectively).